Electronic ignition – simple and easy to assemble, with the simple push of a button your griddle is ready to go, take the headache away from outdoor cooking and spend more time enjoying the outdoors. Transport with ease – easily wheel around your yard or transport from your backyard to the campsite thanks to the removable griddle top, fold up legs and four industrial strength caster wheels. DURABILITY and longevity – this Blackstone grill is built to last with a powder coated Black Steel frame, stainless Steel burners and thick cold Rolled Steel cooktop. Controllable heat zones – four independently controlled 15, 000 BTU stainless Steel burners make a total of 60, 000 BTUs controlled low to high for versatile cooking options. As outdoor enthusiasts & founders of Blackstone we dreamed of a quality outdoor griddle that could cook for large groups or families. In 2005 we made our vision a reality by creating Blackstone products. 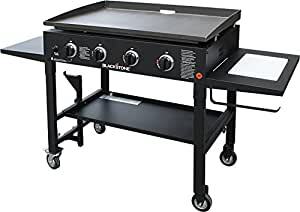 We then Launched the 36″ Blackstone griddle/grill which started it all. Today we dominate the outdoor griddle market & we are becoming the favorite among many outdoor cooking enthusiasts, quickly becoming the go-to cooking option.